Created by Mississippi Territorial Legislature from lands ceded by Creek Indian Nation in Treaty of Fort Jackson, 1814. Named for Major Lemuel Purnell Montgomery, killed at Horseshoe Bend, 1814, while leading charge on Indian fortifications. During Colonial times many Indians lived in this area which was claimed by Spanish Florida and French Louisiana, British Carolina, Georgia and West Florida, and Spanish West Florida. 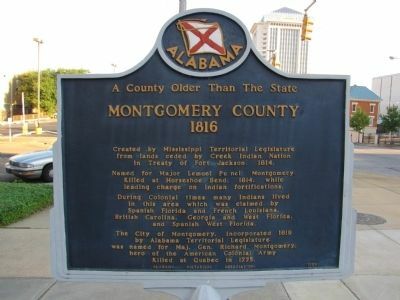 The City of Montgomery, incorporated 1819 by Alabama Territorial Legislature, was named for Maj. Gen. Richard Montgomery, hero of the American Colonial Army, killed at Quebec in 1775. 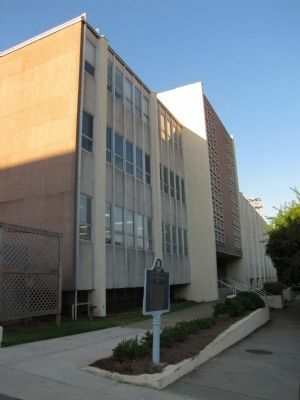 Erected 1959 by Alabama Historical Association. Location. 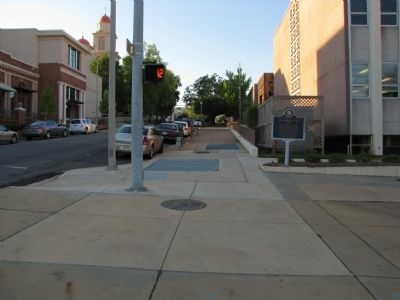 32° 22.568′ N, 86° 18.378′ W. Marker is in Montgomery, Alabama, in Montgomery County. Marker is at the intersection of South St. Lawrence Street and Washington Avenue, on the right when traveling south on South St. Lawrence Street. Touch for map. Located adjacent to the Montgomery County courthouse annex. Marker is in this post office area: Montgomery AL 36104, United States of America. Touch for directions. Looking south along South St. Lawrence Street from Washington Avenue intersection. distance of this marker. Montgomery County Circuit Court / Sit-Ins and Marches at the Montgomery County Courthouse (here, next to this marker); Confederate States of America (CSA) Post Office Department (within shouting distance of this marker); St. Peter's Roman Catholic Church (about 300 feet away, measured in a direct line); Montgomery County Korean War Veterans (about 300 feet away); Dr. J. Marion Sims (about 300 feet away); Office of Dr. Luther Leonidas Hill (about 300 feet away); Chris’ Hot Dogs (about 500 feet away); The Capital City Guards (about 500 feet away). Touch for a list and map of all markers in Montgomery. More. Search the internet for A County Older Than the State. Credits. This page was last revised on June 16, 2016. This page originally submitted on October 5, 2010, by Lee Hattabaugh of Capshaw, Alabama. This page has been viewed 740 times since then and 8 times this year. Photos: 1, 2, 3. submitted on October 5, 2010, by Lee Hattabaugh of Capshaw, Alabama. • Craig Swain was the editor who published this page.